The World- Aramil wears a white longsleeved shirt over which he has an open black vest. The vest had straps and buckles along the front and on the back, in metallic silver the Kanji for "Dragon" is written. Fingerless black gloves covered his seemingly delicate hands. He has the typical brown leather belt that all twinblades typically carried, the one with two leather loops for his blades. He wears black baggy pants with designs similar to the character of Kite, though instead of yellow they were silver. Covering his feet are none other than a pair of brown combat boots. The strange tattoos that The World gives him cannot be seen, but he has markings over his chest, legs and arms. Real World- Minoru actually dresses alot like his character with a few minor differences. For example: the vest that he wears, though jet black and having the character for dragon written on his back in silver, his vest has a hood. Also, instead of baggy pants he wears blue jeans and instead of combat boots, white sneakers. He doesn't have his belt. Other than that, he looks nearly identical to his character in every way shape and form, right down to the odd tattoo's that The World put on his body. 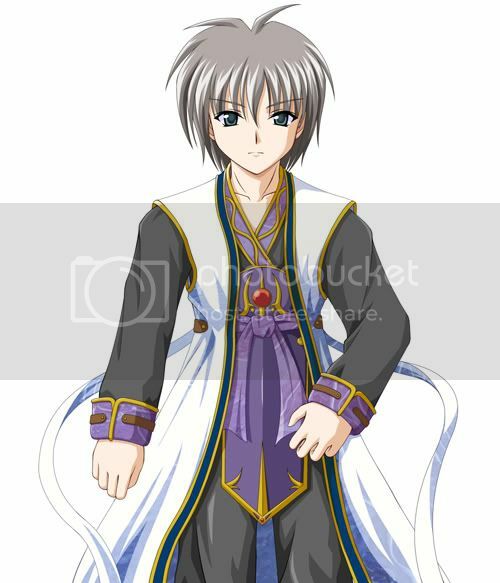 Eye Color: Both in and out of The World, Minoru has deep, dark blue eyes. Hair Color: Both in and out of the world, Minoru has silver hair that falls about to the base of his neck. Personality: Minoru is often cold and distant in both worlds, though once he is befriended, he lightens his mood, becoming playful and friendly. He is extremely loyal to his loved ones and would willingly give his life and soul to protect them. In game or not, he'd always rather be the one that dies. He is a gamer by heart and it has never taken him more than 48 hours of game time to beat any game, so he's extremely knowlegable and exceptionally skilled at games of all sorts, sports and mind games included. Events: Halloween- Trick or Treat!, Costume Face offs! (Disqualified), Go to Midnight Penguin Feast! Minoru walked through the isles of the game store, glancing at the various titles. He had beaten about 98% of the games that this store had to offer over the 2 months that he had been coming there. He was extremely bored and needed something new. Something that would last. Everything to do in school was pathetically easy. He was the best player in pretty much every sport and he had the academics in order to get onto any team. Of course, to entertain himself, Minoru had enrolled in every single team, dropping off as soon as he found out just how easy it was to win competitions. As a result, coaches bothered him daily, practically begging for him to join their teams. Minoru looked up at the very last starter kit for The World that loomed ominously two shelves above him. He was still particularly confused... his teacher was actually the one who would be paying the monthly membership fee as opposed to his parents. The ringing of the schoolbell filled the quiet halls. Almost immediately the buzz of chatter filled every corner of the school as students rose to leave. Minoru stood up at his desk, dressed in the typical navy blue suit all students were required to wear. He silently made his way toward the door, keeping constant eye contact only with the ground, his book bag tucked under his arm. His teacher, Mr. Shinotaka, called to him over the din of the students. "Masahaki!" Minoru shifted from the doorway so that he wouldn't block the students, all rushing to get out of the class, "Yes, sir?" he responded impassively. Mr. Shinotaka frowned, Minoru had this extremely unnerving calm about everything, it baffled the psychology teacher. How could anyone possess such calm? It wasn't that he didn't care, he could see that, the boy was passionate about everything he did, just... so calm about it. It was an admirable, yet at the same time scary quality. "Mr. Masahaki, has something been bothering you lately? You seem rather... well... more detatched than usual." Minoru approached his teacher, "Just bored is all." he replied simply. Shinotaka nodded, "I see... I understand that you enjoy games?" Minoru nodded, "Yes, but it's never taken me more than 48 hours to beat a game, they provide entertainment only for a short period of time, as for sports and other recreational activities... well, if you know enough about me that you understand I like games, you should know my reputation." He replied, seeing where this was going already. Shinotaka nodded again, "Have you ever heard of 'The World?'" Minoru smirked, "The biggest MMORPG since Diablo 2? How could I not?" he asked, almost incredulously, "My parents refuse to make the monthly payment when I have so many other games already." Shinotaka looked Minoru right in the eyes, "Minoru, I'm worried about your health... as such I'm going to offer to pay the monthly payment for that game for you... perhaps it will keep your mind occupied and away from other, less healthy habits." "Sir...?" he asked, confused. None of his teachers expressed such worry that they were willing to buy him something, much less devote themselves to a monthly payment. "Minoru I'm worried that without something to keep you occupied, you'll stray off the right path and into darkness. The World might be just the way to keep you going in the right direction. I'm willing to spend the money to make sure you don't stray." he explained. Before Minoru could say anything in protest, Mr. Shinotaka pulled out his wallet and fished out $80, the cost of a starter kit for The World and put it into Minoru's hand, "Go get your silly game... I think one of these days I might get it too." Minoru had reached his home, locked in his room, setting up the various hardware. Thoughts drifted through his mind wildly... a cocophony of questions which he shot down with obvious answers... just one question remained as he switched on the power and went through the process of registering... Why would he care? It benefitted him in no way. It went against everything that the psychology teacher taught, that all humans had an alterior motive. He picked a character model that resembled him the closest, which wasn't all that hard to tell the truth. He didn't even need any special mods. He finished rather quickly before putting on the virtual headset. He could play all he wanted, his parents had gone on a business trip for several months, leaving him to tend to the house for himself. "Well, I might as well enjoy it..." he muttered under his breath as he hit the 'Log In' option. Minoru is actually a synthetic human being, made with a capability for games far beyond the human limit. He was made in a test tube by his "parents", who used to work for CC Corp. CC Corp created this individual to be able to play his way through seemingly impossible levels within The World. He was to serve as a virus locater and exterminator of sorts. There were two reasons for this, the first being that some areas of The World are extremely complicated and it would take weeks to decode an area to find a glitch, it would be much easier to have a player to pinpoint a glitch since they were, for the most part, easy to spot because of the fluxes in the graphics. The reason they don't send a normal player is because of the fear of the recent virus, where people were put into comas from playing on the MMORPG. Minoru was specifically made to be immune to this virus, he couldn't be put into a coma in that method. Minoru had a flaw, however. His gaming skills, though incredibly great, force him to act as if the character was, in reality, him. This mindset becomes so strong after a certain point that Minoru can actually feel the pain of his characters, and even die if they do. This only happens after a while playing the same game, however, only a game like The World could actually induce such an effect.